Revelations overnight as to the NSW State Government position on mining on the Liverpool Plains have dealt another blow to coal and gas development-weary landholders . To use a cliche term, reports of the death of Labors infamous Part 3A “are greatly exaggerated”. Responding, Deputy Premier Stoner disingenuously sought to paint the document release in purely political terms, claiming the new Government has not mislead the community vis a vie the Namoi Water Study. He further asserts that the Water Study is only ‘a desk top study ‘ and therefore is not relevant to the huge Shenhua Breeza mine, and a ‘site specific’ study is more relevant. As Rosemary Nankivell, CCAG’s gas spokesperson says, Coal Seam Gas is in the news everywhere these days. With Arrow Energy having another well blowout, on the Darling Downs, calls for shutdowns and moratoriums are being heard clearly down in political circles. While CCAG welcomes the NSW Government’s announcement of a 60 day freeze on new exploration licenses for coal and gas, it’s only a start. It comes as news of the NFF fighting fund financial backing of a Queensland farmer challenge to Gas Company and State Government mining approvals. This NFF backing was critical too in CCAG’s recent successful challenge to NSW unfair mining exploration laws. Locally the Pilliga is threatened by a reportedly planned 550 gas wells, and networked pipelines across the black soil Liverpool Plains. 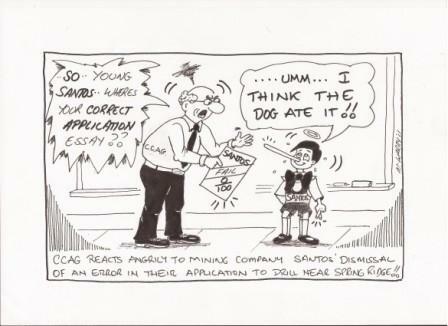 And as the cartoon shows, Santos cannot accurately find the Scrub for the trees. Don’t Hang Us Out To Dry! !